Honestly, I'm not even sure enough about it to take it's picture yet. Karmacide being what it is, you do realize this will mean this will be my favorite sweater I ever make, owing to it's reluctant start. Anyway, it's plain, with a placket neck, cropped with a twisted rib at the bottom. Or it will be. And in other news - I got a $25.00 gift card to Knitpicks for my birthday - I ordered a bunch of Palette so I can make my Beatrix Potter baby wall hanging again. I'll publish the pattern for that once I get it re-charted . . . .
Frighteningly, the little one's feet are almost the same size as mine. He modeled these for me. Still need the ends woven in and blocked. This last picture is a local hawk who has apparently decided he likes our mailbox. My husband told me this (he leaves for work later than I do so he knows these things) He's enormous and quite pretty. So I have a perfectly nice swatch of st. st. for my Comfy, but still no good application for it. Something straight and hip length with a placket neck? Close, but placket necks with clasps look kinda dumb in summer. Laced placket neck? Too informal? Bah, humbug. I think I should just put it back in the closet and get the Glacier scarf, frog it, and make another Diamond Scarf until I get inspired. Just bought a mountain of beads - yay! Spend those pattern proceeds! 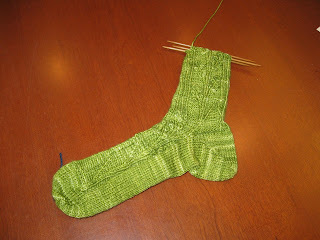 Oh, finished my made up sock last night. Fits like a dream and it is super comfy. However, none of this is interesting enough to take pictures of tonight. 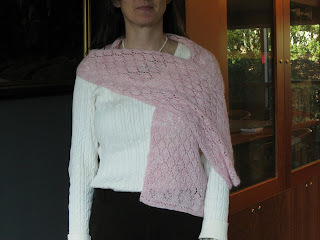 So, I have some Knitpicks Comfy in October, it's lovely and I want to make a summer pullover. 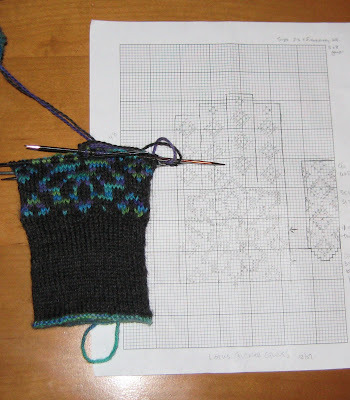 Because I have concerns about it's durability, I want to use a stitch pattern that will keep it solid, so I was thinking a simple aran pattern. 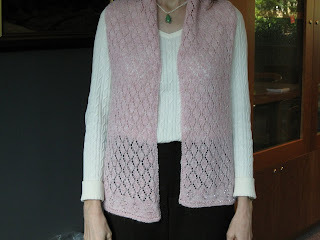 I want the front and back to be basic squares with some shaping for a boat neck and then the sleeves will be basic with a center cable motif that will make a tab up the should seam and continue, wrapping around the two neck edges making for a decorative, non-traditional edging. Not so big a deal, right? I worked and did math and swatched and ripped out and did more math and restarted and ripped out and cast on again and ripped out again. I've designed 3 different sets of cable configurations, and the first 2 have been non-starters. Grr. 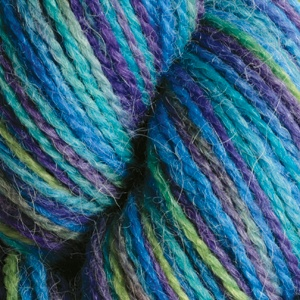 I think I need to use 4's on this yarn, it wants to be very loose no matter what I do, and I don't want a super loose hand on this project. So, what I keep going back to because it doesn't make me mad, my socks. Still using up sock yarn, I designed these from the toe up. I just cast on 32 sts on scrap yarn and used the Nutkin heel/toe short row technique to make my toe, then picked the 32 original sts back up and worked up the foot. I kinda like 'em. Not even sure it's worth writing up this pattern (they're absurdly basic) but they calm me down when I want to throw my charts in the trash. So I was just poking around (rooting?) and I discovered that not only was I born in the year of the pig, but because I was born in 1971 I'm a metal pig. How funny is that? Dang, I might have called my online self METALPIG if only I'd known! High ho, perhaps I'll just design something and call it Metal Pig. Socks are almost done, I think I need to break into some of my accumulated stash. Working up socks is good too, maybe I'll keep that up as well. Great for meetings. 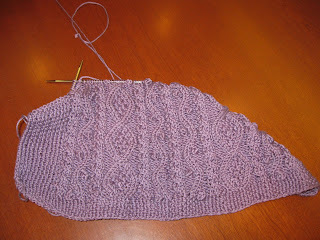 I also want to do another Alice Starmore's Kinsale. I'm thinking in Risata - black. Oh the headaches! You may have noticed that I stay away from profanity and personal details here. Please don't take offense at the post title. Our son got a Ripstick for Christmas, so of course, we all have to learn to use it. It's fun. Lots of fun. I'm not good at it (I'm a notorious clod), but I mastered getting started without help today. I was quite proud. But I still need to master the swiveling with both sides, because as it is now, I only use my back leg. Which means I list to the right. So now I'm watching this bruise form along the whole side of my right leg, knee to hip. And the palm of my hand. All things considered, it was no biggie for falling on concrete full force when your birthday is at the months' end and you're only a year away from 40. I didn't even hit my head. And no one was using a video camera. So all in all, not bad. Here's the other excitement from the weekend. Using up some spare sock yarn Elsie gave me a year ago and some Risata (which I love and think I might make a great sweater) and my sister sent us some paper white bulbs for Christmas. But not here yet. I'm charging $5.00 for this pattern. The difference between knowing how to do something and describing how to it to an unknown audience is huge. How do you make fingers? Ooof. Well, done now and the prototypes are on their way to Elsie in the mail. So I have some Gloss in Winter Night and I've been thinking I want to make something with beads. Maybe a wave motif. But I'm kind of sick of shawls and scarves. I'm having this itch to design a real piece of clothing with beads, maybe a cardigan? I only have 4 skeins, though. A vest perhaps? Sigh. I grew up in the 70's so I'm bell-bottom and vest averse, but maybe I can make it work. Gloves need only 2 more fingers! No school today and no work for me either. Poor spouse had to go in. The little one and I are going outside in a sec once I take shower. 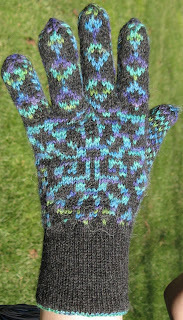 Here are Elsie's gloves, or one of them. Imagination is WONDERFUL; it's making these very soft and pretty. 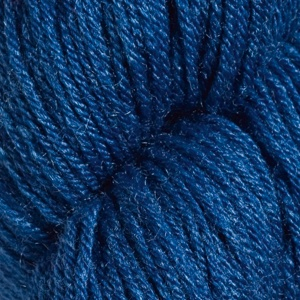 I can see doing a couple different colorways, so I'll write those up when I publish the pattern. The secret to not wanting to kill yourself working on gloves - get some bamboo 3 inch needles to do the fingers on. So much easier to deal with the tension and those tight little corners that way. I work with really nice people. The nicest I've ever worked with, I think. Lucky me. Some of them even knit. This first piece is a sweater for a toddler. It has inspired me to do something with cables! Isn't it beautiful? And these socks! They're so delicate and the color is so fun. I feel like a total ham-handed lame-o because my socks aren't anything like these. Amazing. 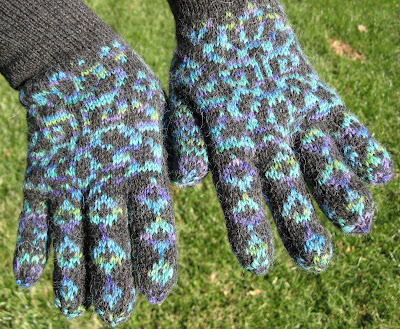 I think maybe I should do something designing with cables and mittens? And finally, my alternate model put on the diamond scarf for me. Does everything look better on? Reminds me of how houses fall apart faster when no one lives there, our artifacts seem to somehow be more alive for in contact with people. What a random, flaky observation to make. Perhaps a 2 week vacation was too long!
. . . both here and at Ravelry. It's free. The gloves are also coming along - fast, I think because I really want to see how this Lotus flower I've charted comes out. I'm using Knitpicks Imagination Mermaid Lagoon and I like it because it's soft and nice feeling and I think the nylon will help the loves wear well, esp. on the finger tips. Shawn the Sheep by some people who worked with Nick Park. Also, this inspired a trip to Wal-Mart for plasticine so we could build our own sheep and pigs. Catan - like Monopoly, but more fun, with more strategy and takes less time. Perfect for the 6 and up set. JCVD - you kinda have to see it. Penn & Teller Bullsh*t seasons 4-6 - I understand, not for everyone; even if you do like it, a little goes a long way. Cleaning up the Christmas stuff earlier rather than later. Scarf pattern should be up in a day or two - it's blocked now. 9x60 inches. I need a model.